Groupe Country US basé à Denton (Texas) et composé de Mike Eli, James Young, Jon Jones et Chris Thompson. Fusing a young man's take on heartland rock with the tougher side of Texas country music and the cocky enthusiasm of alt-country firebrands, the Eli Young Band have become a potent draw in the Southwest on the strength of local airplay and extensive touring. The Eli Young Band's story began when Mike Eli and James Young both enrolled at the University of North Texas and found themselves sharing a dorm room as freshmen. Both played guitar, and the two new friends starting writing and singing songs together. Under the name Eli & Young, they began playing acoustic shows at local bars and coffeehouses, and in time they expanded the band into a full electric quartet with the addition of fellow students Jon Jones on bass and Chris Thompson on drums, thus giving rise to the Eli Young Band. The group became a potent local draw, and in 2003 opened a show for rising star Miranda Lambert. Producer Frank Liddell saw the show and was impressed enough to offer the band a deal with his independent label, Carnival Recording Co. 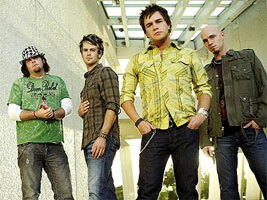 The Eli Young Band's debut album, Level, appeared in 2005, and the songs "That's the Way" and "When It Rains" began scoring significant airplay in the Lone Star State. The Eli Young Band's enthusiastic live show helped them draw a large and loyal audience in the Southwest, where they were able to fill 2,000-seat venues as a headliner, and they toured the country as an opener for the likes of Pat Green, Cross Canadian Ragweed, and Jack Ingram. In 2006, the group's live show was captured for posterity on the concert recording Live at the Jolly Fox, taped during a gig at a club in Huntsville, Texas. The Eli Young Band then landed a deal with the Universal-distributed Republic Records; a video for a new recording of "When It Rains" subsequently received extensive play on Country Music Television, and the group's first album for Republic, Jet Black & Jealous, was released September 2008, with "When It Rains" and two other songs from the album, “Always the Love Songs" and “Radio Waves,“ becoming Top 40 hits. The follow-up album, Life at Best, delivered another hit, the Liz Rose and Lee Brice-penned “Crazy Girl”. The album was well-received by fans and critics alike, and the following year the band were nominated for a host of awards, including a clutch of Academy of Country Music Awards, where they took home the Song of the Year accolade for single "Crazy Girl," while they were also up for Grammys for Best Duo/Group Performance and Best Country Song. They soon returned to the studio to record sessions for their fifth album, and in 2013 the fruits of their labor appeared in the shape of 2013 single "Drunk Last Night," which raced to number one in the U.S. Country Airplay charts. Building on this success, they headed out on tour before announcing 10,000 Towns was set to be released in 2014; it was preceded by the second single "Dust." An EP called Turn It On was released in the spring of 2015. For 2017's Fingerprints, the Eli Young Band signed with the Big Machine subsidiary Valory.